If you are thinking about an Italian Christmas lunch or dinner for your family and friends you can choose a traditional menu trational menu or decide to delight your guests with two new recipes proposed by Chef Daniel Zennaro, of the restaurant Vecio Fritolin in Venice, where traditional ingredients are used in a new creative way: Scorpion fish broth, egg tagliolini and mullet roe, and steamed bream with spicy red lentil in a shellfish sauce. Clean the scorpion fish, fillet it and take the skin off. Place the fillets in the fridge and put all the carcases under running water to clean. Meanwhile, peel all the vegetables and make a coarse mirepoix. Sauté with a little olive oil in a pan, add the fish carcases and cook well, then add the tomatoes and cover with cold water. Let it simmer on a gentle fire for about 4 hours, then pass it through a food mill to extract all the juices and then through a muslin cloth to get a clear broth. Let it reduce further by half on a gentle fire. 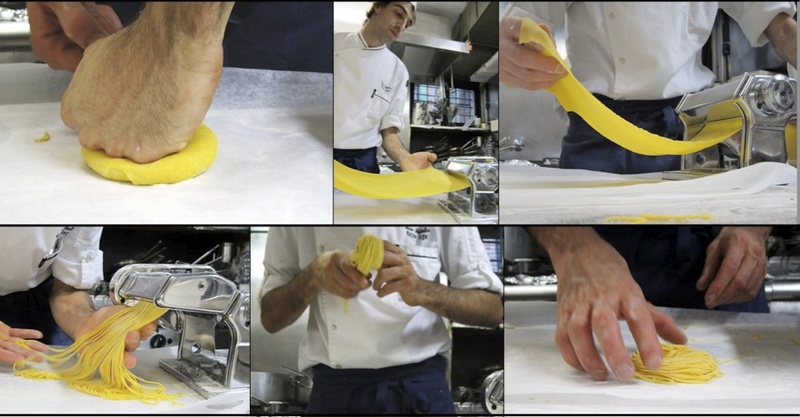 To prepare the pasta dough, mix the flour with the eggs, forming a smooth elastic ball. Put vacuum and store in refrigerator, roll out the next day with the a pasta machine to obtain sheets of about 50/60 gr each and then cut in tagliolini and store in the fridge slightly dusted with semolina flour. Cut the scorpion fish fillet into chunks and brown them in a hot pan with a drizzle of olive oil. Cook the pasta in salted water and place in a pan with a bit of cooking water and extra virgin olive oil. With the help of a fork, prepare a nest of tagliolini and place in a deep dish. 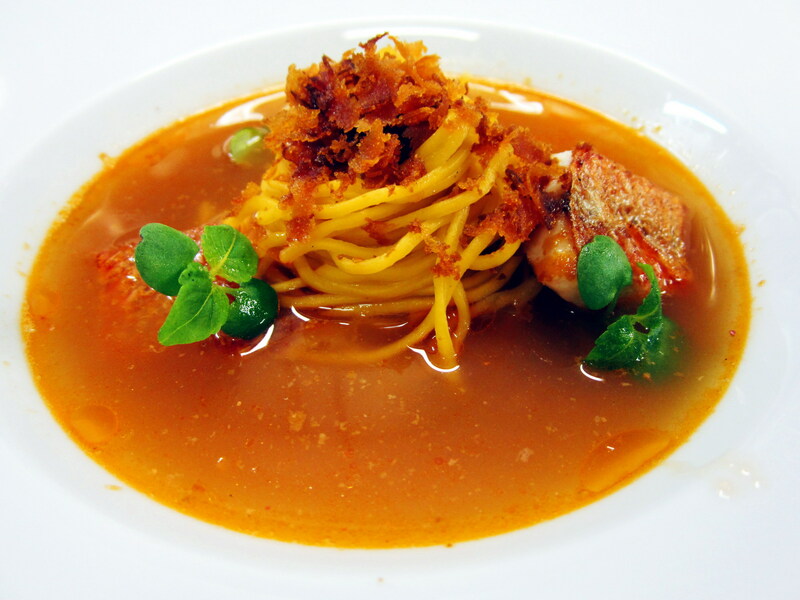 Cover with scorpion fish broth ¾ of the pasta and add some pieces of fish fillet on top. Complete the dish with grated Cabbras mullet roe, a grinding of fresh pepper and a sprig of chervil. Steamed bream with spicy red lentil in a shellfish sauce. The preparation is simple, or at least this is what the chef says! First you have to gut, scale and fillet the sea bream or you ask your fishmonger to do it for you. Then take the skin and bones out and prepare four portions. Meanwhile, chop the red onion and sauté in olive oil. While the onion is cooking, add the lentils previously soaked in in cold water for an hour. Finally, add the shellfish broth and let it simmer. How can you tell if everything is going well? The simmering mixture should look like a lentil soup which is slightly more liquid than usual. If you have achieved this, then you're on your way to get the best recipe. Do not forget to add salt. Boil the water in a steamer with the spice mix and cook the slices of sea bream for about eight minutes. 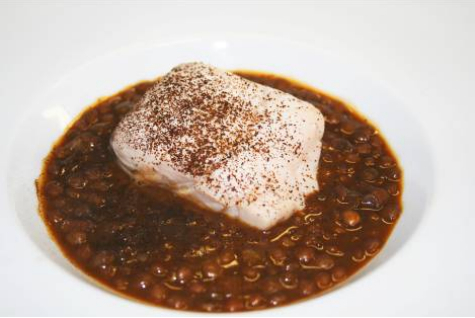 Then served the lentil soup slightly drained and place the sea bream fillet on top. Finish off with a sprinkle of powdered black tea and a few flakes of Maldon salt. 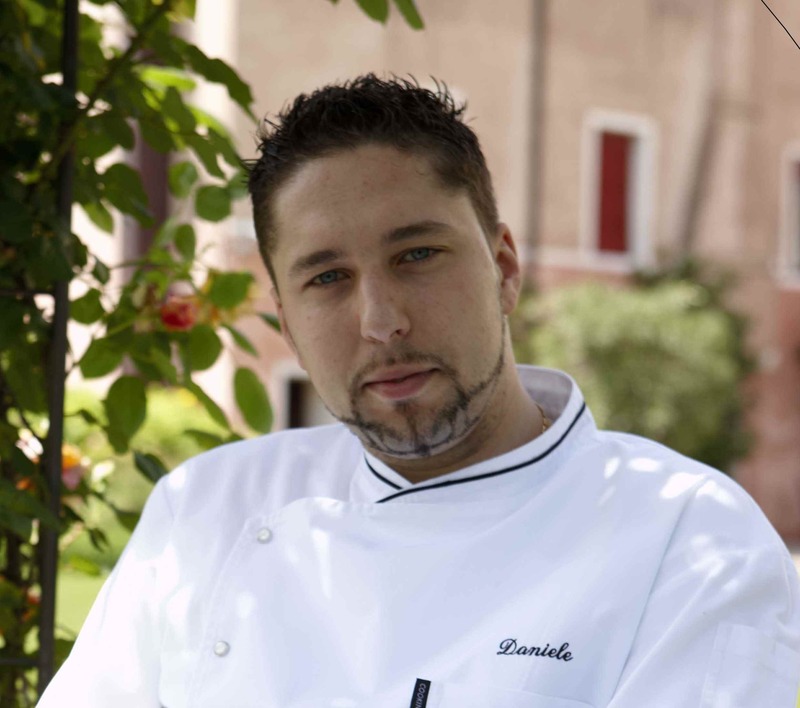 For those of you who might have the chance to celebrate Christmas in the wonderful atmosphere of Venice, you can enjoy these dishes directly prepared by Chef Zennaro for you at the Osteria Vecio Fritolin, just two steps away from Rialto’s market. Closed on Monday and Tuesday lunch time.